My dessert loving vegan best friend had her birthday recently and I wanted to make something delicious for her birthday cake. A few weeks ago I had dinner with a group of vegan gourmand friends at Monk Bodi Dharma. The desserts there were sensational, (we ate them all!). The best one by far was a white chocolate and raspberry deconstructed raw cheesecake. This got me thinking about cheesecake as a possibility. 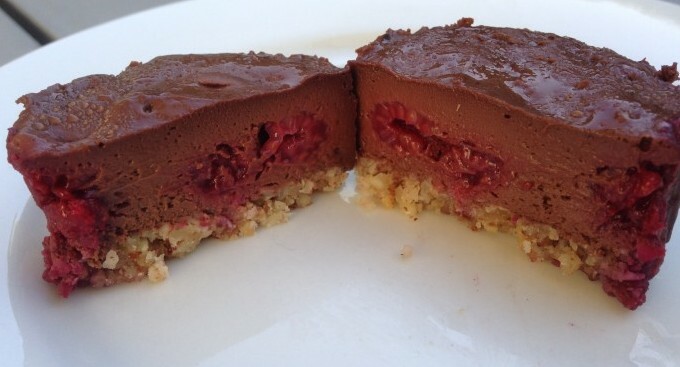 I found an old recipe on Novel Eats for a chocolate cheesecake that looked pretty good. It isn’t a raw cheesecake but a cooked one. I made a baby one in a small 8cm springform pan to give it a test drive. Of course I tinkered with it, changing the crumb base to a nut one, adding raspberries to the filling and using slightly less chocolate. It tasted wonderful and the texture was perfect, but when I was unmoulding it from the springform pan it fell to bits and it became an accidental deconstructed cake! This was probably because I added the raspberries, thus breaking the texture of the filling too much. I wanted to leave the raspberries in the cake for the flavour and didn’t want to make a large one for the birthday party and risk having it fall apart. So I decided to make individual ones for the party in large muffin-sized patty pans. They look good, don’t run the risk of falling to bits at unmoulding and are easier to eat at a stand up function. They were such a success that I took some more to another birthday picnic a couple of days later. It’s hard to go wrong with chocolate and raspberries. Put the nuts into a food processor and blitz until they turn into a coarse meal. Add the coconut and coconut oil and pulse until it is well mixed and the mixture will hold together when squeezed. In a blender, mix the silken tofu and the tofutti cream cheese until smooth. Add the sugar and blend again until the sugar is dissolved. Add the vanilla, lemon juice, cornflour and non dairy milk and blend until smooth and well combined. Melt the chocolate in a bowl over hot water or in the microwave. Add to the mix already in the blender and blend until combined. Use a large muffin pan lined with patty pans. Add a heaped tablespoon of the base mixture to the bottom of each patty pan. Use a glass to press the mixture into the patty pan firmly. Place 4 or 5 raspberries into each patty pan and fill with the chcocolate mix to the top. Cook in a 175 degree oven for 20 minutes. They will raise slightly and be soft but springy when done. Remove from the oven and allow to cool in the pans. They will collapse back to being flat.